Being cheap does not mean low quality. I think as a Moto E owner, you already understand this. To make your Moto E even sweeter, Motorola just released Motorola Alert app for Moto E, and this app is currently exclusive to Moto E! Of course, the app will be compatible with Moto X and Moto G in the future. Motorola Alert is an extremely useful emergency alert app that lets you quickly alert people important to you when you need them, for example, when you are in danger. 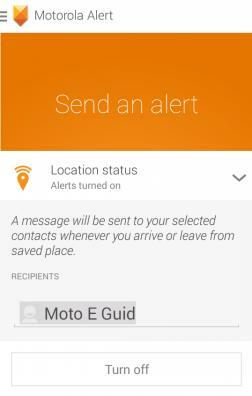 Once Motorola alert is enabled in your Moto E, it will begin sending periodic notifications with your location to the people you designate so they can act fast to give you the help you need. This means Motorola Alert may also be used as a tracking tool. to send out alerts to meet you at your current location. The designated contacts will receive the SMS/MMS. You can broadcast the info to several contacts. Of course, you need designate the contacts when you setup the app. You can also change the list of designated contacts later. Why Motorola Alert can save your life? 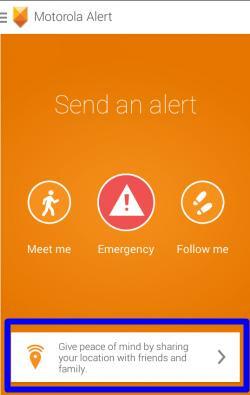 Motorola Alert is primarily an emergency alert app. Whenever you feel you are in an unsafe environment, or you need some help urgently, the persons you trusted can receive the alert immediately and may provide the help you need. 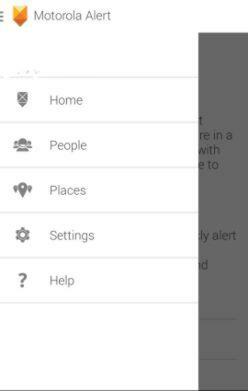 As the alert message includes the location info, your contacts can easily locate you. Very often, when you are in danger, you may have problem to explain your whereabouts. The location info in the alert message can be extremely useful. How to setup Motorola Alert? Motorola Alert is NOT pre-loaded in Moto E. You have to open your Play store to search and install the app. If you are reading this post, you can follow this link: https://play.google.com/store/apps/details?id=com.motorola.bodyguard. Once installed the Motorola Alert app from the Play store, you can then start the app to setup the app. You need designate at least one contact to receive the alert messages. This contact must be added to your address book (People app) before you can select it. 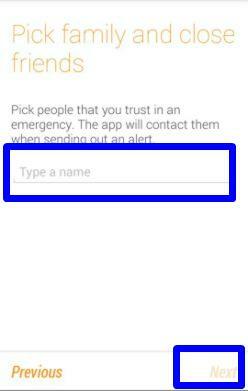 You just type the name and the app will lookup it from People app in your Moto E. All these contacts will receive the alert messages. Once finished, tap Next to designate one emergency contact. The emergency contact is for phone calling in case of emergency. 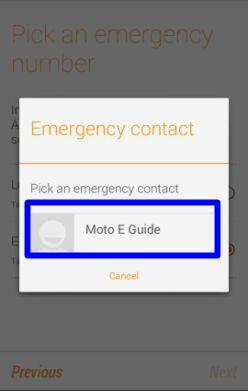 Because Moto E can only dial one number at any given time, you need specify only one emergency contact in Motorola Alert. In Motorola Alert app, you need specify one of them during setup stage. Remember when you are in panic, you have no time to do selections. None. Only alert messages are sent. Auto-dial the emergency number you specified in the previous step. Trigger the sound alarm. This is useful when you need attentions from persons nearby. The siren is very loud, so don’t test it in your office. How to use Motorola Alert? 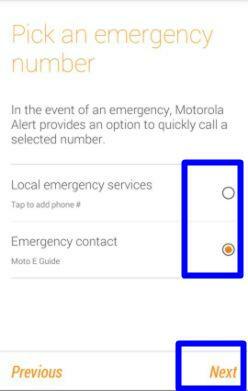 Motorola Alert can send 3 types of alerts (emergency, follow me, meet me) to the designated contacts currently in Moto E. Tap one of the icons will trigger the corresponding alert. Each alert has its own message template. You can adjust them for your taste. 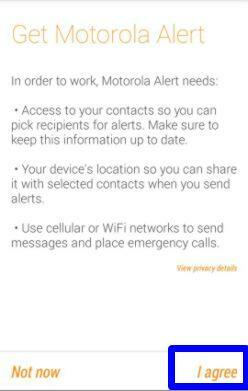 In addition, Motorola Alert also has a “stay connected ” non-emergency feature to automatically share your locations with some of your emergency contact. 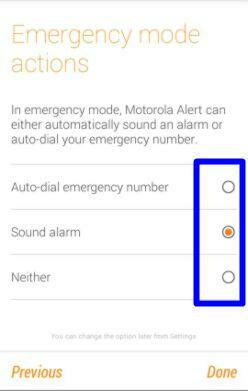 How to use Emergency alert in Motorola Alert? 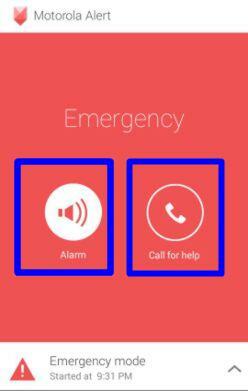 When you need immediate help, you may tap Emergency in Motorola Alert app as shown above. Once emergency alert is triggered, the emergency alert messages will be sent out to the designated contacts in 5 seconds. Before you cancel the emergency mode, the messages will be sent out every 5 mins by default (you can configure this frequency, read on). Once you cancel the emergency mode, a “I’m safe” message will be sent to your designated emergency contacts. In addition to the emergency alert messages, if you want, you can choose one more action: triggering the alarm or dial the emergency number immediately as shown below. Tap the “^” button in the right side of Emergency mode info, as shown above, then you tap cancel button. In the notification area, tap cancel as shown below. How to use Follow Me alert in Motorola Alert? 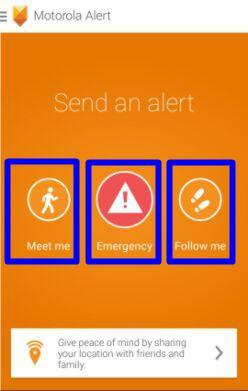 Follow me mode in Motorola Alert allows you to update your location to the emergency contacts periodically. You can use this alert to track kids who are going out for camping for example. Unlike emergency alert, this alert allows you to select recipients from the emergency contact list. So, it will not broadcast to all persons in the emergency contact. Of course, you can specify the update frequency, and the message text as shown below. 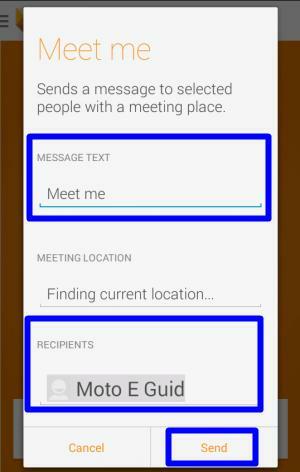 How to use Meet Me alert in Motorola Alert ? 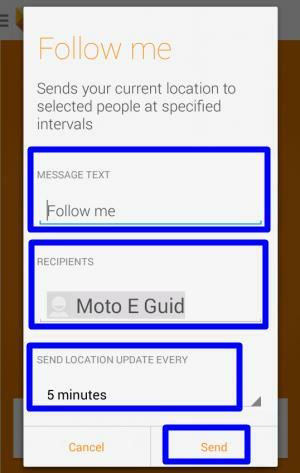 Meet me mode in Motorola alert allows you to send out the request to meet you at your current location. You can customize the text message and the recipient. 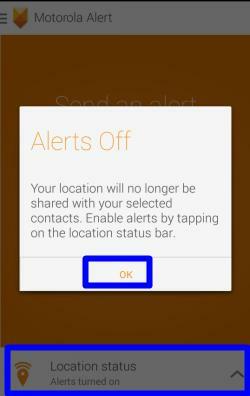 How to use stay connected (location sharing) feature in Motorola Alert? 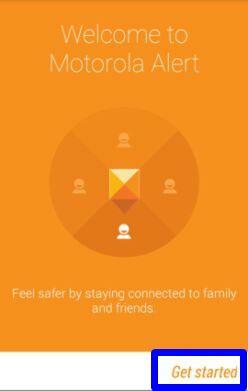 Stay connected feature in Motorola Alert allows you to share your location with some emergency contacts when you reach or leave some pre-defined locations (e.g., home, office, school…; up to 5). This is not an emergency alert. Rather, it updates your location for your loved ones so that they know your whereabouts. 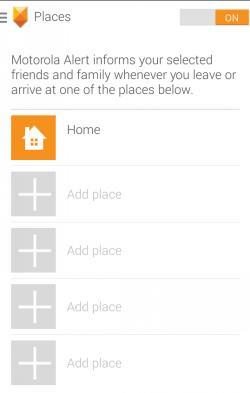 Once at least one place is defined, you can turn on and off location sharing as shown below. How to change settings of Motorola Alert? 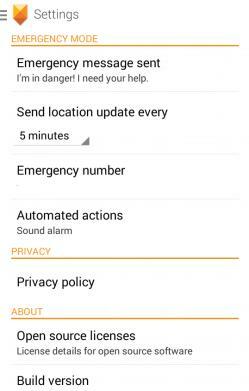 After you setup Motorola Alert in Moto E, you can change the settings later on. Start Motorola Alert app, tap menu key (3 vertical dots in the top left). You can find all settings there. You can define locations, designate people to your emergency contacts. Tap Settings. You can then customize/change the emergency alert settings, including the message, location updating frequency, emergency number and the additional actions. Can I get Motorola Alert on Moto G and Moto X? Motorola Alert currently is exclusive to Moto E. But Motorolas has promised to bring this app for Moto X and Moto G in a few weeks time. So, if Google play says the Motorola Alert is not compatible with your Moto G or Moto X, it means this app is not ready for other devices yet. Hopefully, by June/July, you will be able to install Motorola Alert on Moto G and Moto X (in addition to Moto E). Do you have any questions or problems with Motorola Alert on your Moto E? More how-to guides , tips and tricks for using Moto E are available at Moto E how-to guides page. Hi, I purchased a Moto E last week. I have only 1 SIM card. Go to All contacts > Click on a contact. Instead of asking me if I want to make a call, or send SMS or do anything else, the phone is directly making a call. How to avoid this, and make the phone ask my choice? This is because you open contact from phone app. Phone app is for make calls. The contact app in Moto E is People app. If you open contact there, left side is for making calls, right side is for sms. Thanks for the quick reply. This solved my problem! You can just enable it in settings- apps. i have two sims on my moto E.. one airtel and one docomo.. airtel provides the net while docomo is the local number.. the alert is sending msgs and calls from airtel while i want to do so via docomo.. how do i make it possible? default sms sending network is already set to docomo in the dual-sim settings…. You can assign which one is for data (usually sim 1). For default sim, you can change to “always ask” , then switch. Hi,simon, MotoEOwner, i have the same issue as MotoEOwner, and we both have the default sms sending network correctly defaulted. We don’t want to change the default network for sms sending, we want to make MotorolaAlert to honor our default sim choice for sending sms to a given number. MotoEOwner, BTW, my SIM1 is set for data (your airtel) and my SIM2 is generally used for SMS and calls (your docomo). Have you tried switching the sims? I’ll try to make some time to give that a try tonight. I cant see the contacts of my sim in the mobile? Open People app, tap the menu key (3 vertical dots in the bottom right), tap Import/export. You can import contacts from SIM card. Please note, Moto E does not write to SIM card, only import. If you frequently user Mototola Alert ‘Follow me’ or ‘Meet me’ feature, You can automatically get the track plotted on the map (even when offline ) by using ZTrack-free on the receiver Phone. Does it work if you unplug it? Did you mean emergency alert? If yes, this post already shows you how to exit the alert. If you cannot make calls and get the emergency called only, then, your sim card is not working properly. If you are sure the sim card is activated, you may try to re-insert the sim card. How this app send sms , is it charge from mobile network or it send SMS via internet. Please give information. The messages is sent through normal sms. Mobile data is not required. Last month I have purchased Moto E, New text SMS pop up is not coming. Please help me to resolve this issue. In recent days, the following message is coming. If i select wait, phone will hang for some time. If i select Ok after refreshment phone start up freshly. How to clear this problem? When I want to make a call after select sim it’s supposed to go to call to the contact. But my one many times returned back to main menu after selected the sim.pls advise me. Yes of course the other sim is using for 2g data only.and calling for best network in India IDEA. Almost always using net sometimes mobile data many time WiFi. Pls help how to fix this returned to main menu after dailing. If one SIM is using 2G data, the other SIM will not be available. Tap and hold the message, you can then found the details of the message. It’s vert likely from your phone company. You can simply disable notifications from the app. Uncheck notifications in app info page. I receive emergency alert message for every 15 mins in my Moto G device, I have no Moto alert app in my device and I fon;t know why I receive this, How to get rid of this? I use moto e . I need to send contacts via the default sms app. But i can’t do it ….any sugesstions?? you cannot share contacts through sms directly in Moto E. You need copy and paste. Sir my moto e mobile takes blur image when I take snap of a printed matter.. Even it is not readable through camera without taking snap..
it is normal because Moto E camera does not have the autofocus feature. So, it is not good for small printed text. In the notification area, you can stop current alert. You can stop the app in settings – apps motorola alert. Tap force stop to stop the app. Tap turn off to disable the app. You can disable the motorola alert on settings – apps. What’s message type? Emergency or follow-me? Anyway, you can change the settings inside the app.